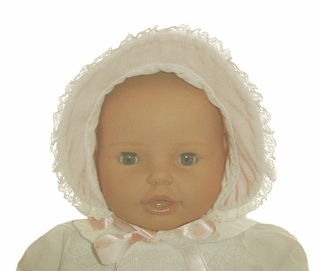 This darling new cotton corduroy bonnet is a soft ivory color. 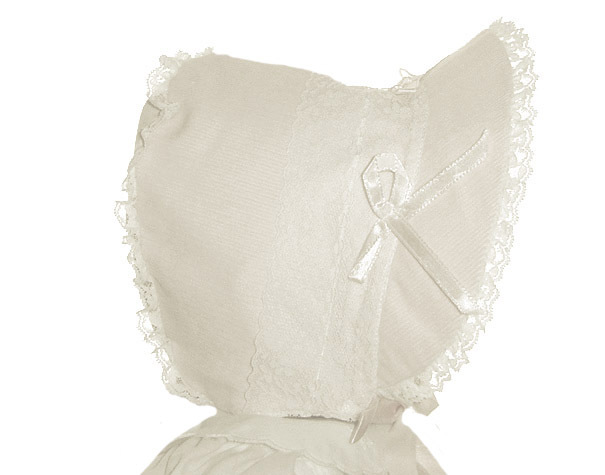 It features wide white lace and and white satin bow trim. Sizes newborn, newborn to 3 months, and 3 to 6 months have a wide lace trimmed face ruffle framing the face (not pictured). Size 21 to 24 months has face brim rather than ruffle. See pictures left. The bonnet ties under the chin with fabric ties (not with satin ribbons as pictured). This would be a lovely warm bonnet for your baby or toddler girl. These bonnets run small. Please see Bonnet Size Chart in box below. Please measure carefully and order by baby's head circumference rather than age to assure best fit. Note: This darling bonnet is also available in pink. See below.